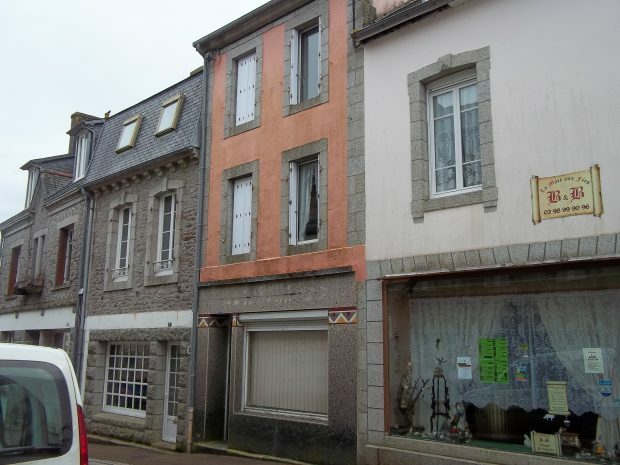 Large village house with two floors and back garden, in the centre of Huelgoat! Located in the heart of the village, a few steps from the square, this large house offers a good structure, it will need some attention inside, modernization and upgrading but it has a lot of character and could be very attractive with some interior work. It could also be a shop downstairs and apartment on top. On the ground floor is the entrance and three other rooms which could be used as a lounge, dining room, and the kitchen with dining space which is very basic at the moment. With exposed stone walls and slate floors, it could be very charming. Also, a conservatory which opens into the garden, and a WC. A pretty staircase leads to the first floor and a long hallway with two extra large bedrooms and very nice wood floors, a bathroom with shower and another one with bathtub, finally, a separate WC. On the second floor there are two other double bedrooms. Further, there’s an attic, original windows, oil central heating and it’s connected to the mains sewage. A nice private garden in the back, it is a long garden with another entrance from the bottom. Easy parking on the street. This is a nice project for someone who wants a village house with potential for a shop; and, it’s next to all the facilities, lake and forest!